Lest anyone get excited thinking that this is my final thoughts on Tortilla Soup post...or my What makes a great Tortilla Soup post...or the post announcing My Favorite Tortilla Soup: after the quest...I'll say right off the bat that it is not. Sorry about that. It may seem that I'm dragging my feet, but I'm actually working on a little project, so bear with me, please. I will eventually post my favorite. I mean, you didn't think that just because my year-long quest was over that I'd stop trying different versions of Tortilla Soup did you? As if! It only fueled my fire. Yes, I say "tortilla" soup...because this is a very loose definition of this bowl of soup. I mean, when Mexi took one look at it (after I told him that I made Tortilla Soup), he said "This!? It looks like Vegetable Soup." MmmHmm. My thoughts exactly. It's a veggie soup with tortilla croutons. It's pretty lackluster...as far as Tortilla Soup goes, that is. I mean, it's a tasty veggie soup. There's no heat and no flavor profile of a Tortilla Soup. The added raw jalapeño as garnish does add some fire, but without it and the tortilla chips, you wouldn't guess it to be what it's labeled. That said, don't be discouraged, it's a good soup in and of itself. I actually cut down on the amount of veggies that were in the original recipe, too. The one unique thing about this version that I pretty much adored was the addition of sage to the tortilla chips...that was pretty ingenious. The earthiness was a perfect compliment. I'll be remembering that for future versions. 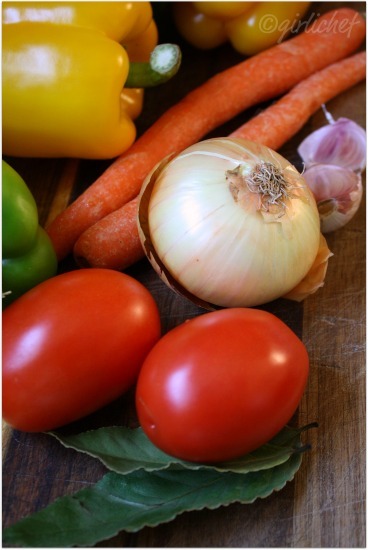 Place a large soup pot on medium-low heat and pour in a good glug of olive oil. Add onion, garlic, carrots, and bell peppers. Sauté gently, stirring occasionally, until everything has softened, ~10-15 minutes. Add fresh tomatoes, bay leaves, bouillon, and canned tomatoes. Fill the can with water 2 times and add it to the pot. Bring to a boil, reduce to simmer and let bubble gently for ~20 minutes. 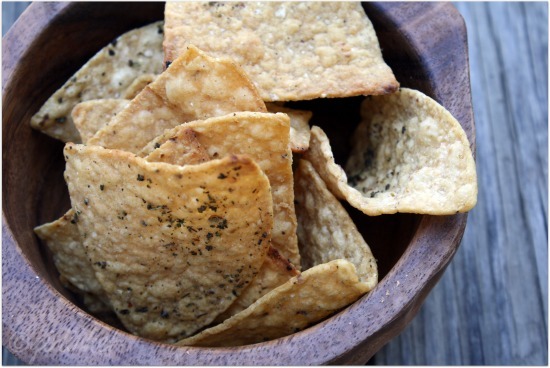 Lay the tortilla chips on a sheet tray, drizzle with a bit of olive oil and sprinkle with the sage. Slide into preheated oven and cook for a few minutes, until warm and starting to turn golden on the edges. In the meantime, grate the zest of the lime over your avocado and then squeeze the juice from that lime onto the avocado, as well...toss. Adjust seasoning on soup with salt and pepper. Divide soup between bowls and pass the garnishes! It's a POTLUCK this week at IHCC. Love the ingredients in this soup. So hearty and filling. The sage tortilla chips do sound like fun. After all the tortilla soups you've tried, I can see how this would be so-so as a tortilla soup. Can't wait to hear the summation of your quest. Never made or had avocado soup...definitely a must try after reading it. Que gran plato, me encanta. Such a healthy soup with all the veggies in it .. I have book marked it. wow! 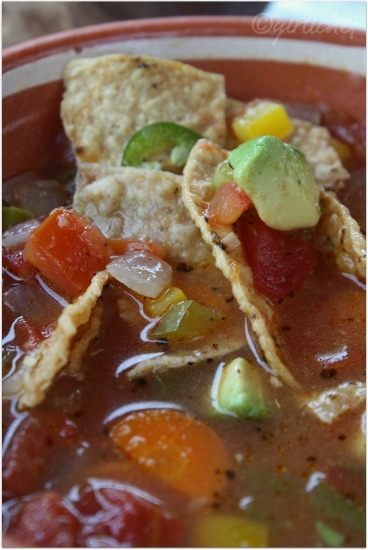 I love the look of your tortilla soup! If soup could be considered beautiful you have nailed it! I often make really simple vegetable soups like this all winter and yours looks like a winner even if some people call it lackluster! It's goodness in a bowl. And I HAVE to make these tortilla croutons next time! Crunchy fun! 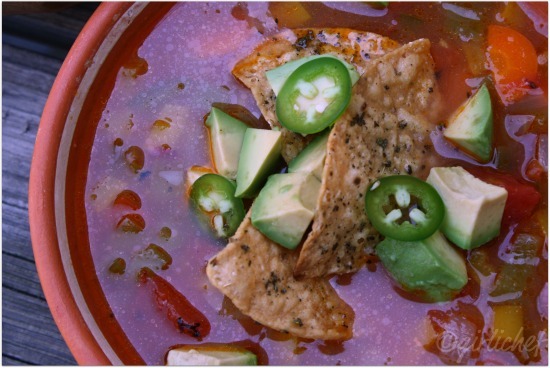 Love but have never made tortilla soup; this one looks real good. this looks delicious!!! can you *believe* i've never had tortilla soup?? GASP! Well, being a brit and all, jamie can't really be expected to understand tortilla soup, now can he? Sounds delicious nonetheless! 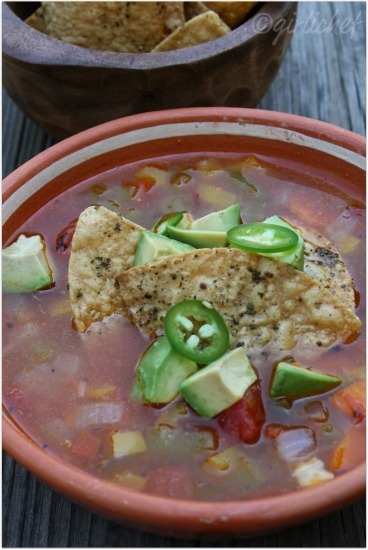 wow .. love to see your passion for tortilla soup :) This is so good and looks delicious. Comforting soup.. looks ao healthier & filling. Going to try this for dinner..
OK, so we learned Jamie can't do everything well. ;-) It still looks good--maybe just a re-title is in order? Thanks for sending it to Souper Sundays too. Well that is pretty good looking soup - it may not be the "real deal" as far as tortilla soup goes (I of course could not possibly say since I am still hitherto a tortilla soup virgin), but it nevertheless looks like great soup. Love the idea of the sage on the tortillas too. We are inspired by your blog, especially when they have an outstanding tortilla recipes like this one. You inspired us to start our own blog on fresh tortilla and to give you a shout out in our current post. We hope you'll come and visit with us. Gosh this soup looks pretty amazing and you can call it whatever you want! I love the sage on the tortilla chips and earthy and classy. I love reading about all your tortilla soups but I have never actually made one or even eaten one. When you post the definitive one I promise I'll try it. I'm definitely digging the sage tortilla chips, but I can see what you mean about this being more of a veggie soup than a tortilla soup. It does look like a very hearty and pretty soup though. Never would have thought to put sage with a tortilla soup! A little different maybe, but a nice change? Looks delicious.